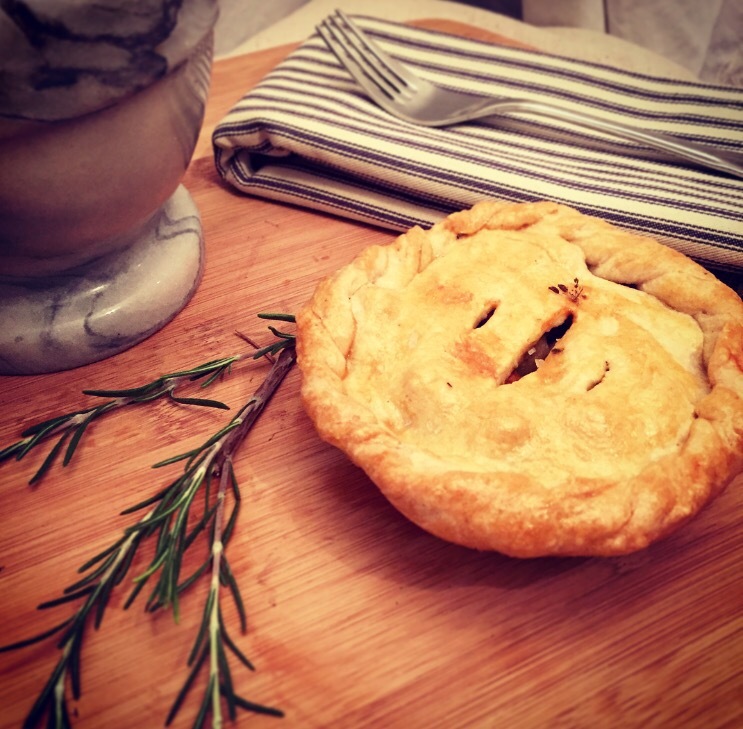 When I saw that it was National Pie Day, I could not pass up the opportunity to take a stab at a meat pie. I definitely prefer savory pies over sweet pies. When living in Chicago I was spoiled with great restaurant options. Two of my favorite neighborhood eats served up delicious traditional English savory pies and the other made a great pasty. I’ve eaten plenty of both, but have never made one of my own, so what better time than now. Lucky me, after a quick ingredient assessment I saw that I had ground lamb, sausage, and leaf lard from Royalton Farms. The leaf lard is from a few months back when I rendered Mangalitsa pig belly from Royalton Farms, freezing a few jars. Using leaf lard when making pastries will give you a nice, flaky crust. Some people hear “lard” and associate it with bacon grease in that it’ll have a bacon flavor. Not the case, it really doesn’t have much flavor at all and it actually has less saturated fat than butter. I’ve found that when using ground lamb it’s best to mix it with sausage since it is so lean. In this case, I used a 1 lb of lamb with 1/2 lb of pork sausage mixture. Begin with making the dough – its best to refrigerate it for 2 hours before rolling into pies. Preheat oven to 350°. In a food processor combine flour, salt, pepper and sugar until blended. Next add in the leaf lard. This will become a dry, dense dough mixture. Begin adding in the water 1/4 cup at a time and use the pulse mode until the dough mix is smooth. Remove from the food processor and roll into a ball. Place the dough ball either on a sheet of plastic or parchment paper and refrigerate for 2 hours. If your short on time, you can put it in the freezer for 30 mins. For the filling, begin by sauteing the onion and garlic in 1 tablespoon of coconut oil. Once they have browned slightly, add in the diced mushrooms. Continue to cook for 2 minutes. Now add in the lamb and sausage mixture. At this point, I added salt and pepper and continued to brown the lamb for a couple of minutes. Add the stock, carrots, and dried herbs and continue to simmer for 3-5 minutes. Add in the potatoes and continue cooking to help develop the flavor in the filling. If you feel the stock is not thickening to your liking, add 1/2-1 teaspoon of corn starch. Not time to make the pies. I made both mini pies and half moon, hand held pies similar to a pasty. For mini pies, you will roll out 2 circles of dough (about the size of a golf ball). Roll out the dough somewhat thin as it will puff up a bit when baked. Line the bottom of the pie tin with one dough circle, fill with a spoonful of meat and veggie mixture, and place the second dough on top. Finish the edge by simply twisting the two pieces together with your fingers. Cut a couple of slits into the top to allow the steam to escape. Brush the top with the beaten egg. For moon shaped pies, take the same amount of dough and roll out in a circle. Place a spoonful of filling in the center and fold the dough over. Use a spoon to crimp the edges, brush with the beaten egg. Cook the pies for 30-45 minutes or until the tops are golden brown. When done, i finished mine with a bit of sea salt flakes. The dough can be stored in the freezer for about a month. You can also premake pies and freeze.